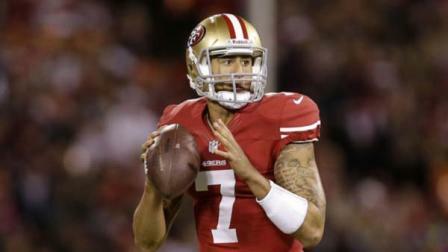 Should Colin Kaepernick be the 49ers Starting QB? This week’s Monday Night Football game featured the 49ers and Bears, which was going to be an intense defensive battle. It turns out though that after the game, all people could talk about was the 49ers’ offense. 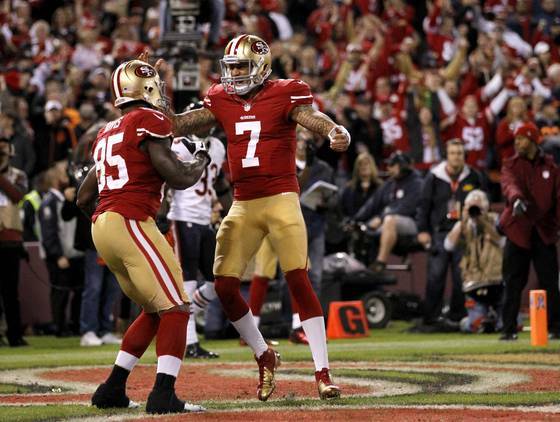 The 49ers beat the Bears 32-7 behind a breakout performance from backup quarterback, Colin Kaepernick. Kaepernick not only slaughtered one of the best defenses in the league, but he also has caused the 49ers coaches and fans to question if he should take over the starting role. Alex Smith hasn’t been cleared yet to play, because he’s still experiencing concussive symptoms. Coach Jim Harbaugh announced Wednesday night that Kaepernick will start this upcoming Sunday against the Saints, but should he be the starter for the rest of the season as well, even if Smith is healthy? In Kaepernick’s first start in the NFL, he completed 16 of 23 passes for 243 yards, 2 TDs, and he ended up with a QB rating of 133.1. His first career touchdown pass was to Vernon Davis in the fourth quarter, and his second touchdown was to Michael Crabtree in the third quarter. Kaepernick also led a 96-yard touchdown drive (the longest of the season), and completed a beautiful 57-yard pass to Kyle Williams, which led to the Davis touchdown. Kaepernick and his teammates looked like they were having even more fun than any other time in the season. He was an inspiring and passionate leader in his first win as a starter. Smith truly is a Honda. He’s reliable, he’s sturdy, and you know exactly what you’re getting from him, which isn’t bad. Kaepernick is the fun, exciting, flashy Porsche that the fans finally got to see on Monday night. The game against the Bears was one of the most entertaining 49ers games I’ve seen in a long time. In addition to Aldon Smith’s 5.5 sacks, Kaepernick’s performance made this game so much fun to watch. Even though he’s known for his running and his speed, he executed some absolutely perfect throws, which were beautiful. “I’m just so proud of him in that moment because the ball that he threw me, it was just one of those balls that you see Tom Brady throw,” Davis said. “Second window, right on the money. Surprise. I didn’t expect the ball to come because we ran that play quite a few times and the tight end usually don’t get the ball on that play.” Vernon Davis must have been so happy that Kaepernick started, because Alex Smith had a lot of trouble finding him in the past few games. With a coach like Harbaugh and the same offense as last year, we’ve seen Alex Smith at his best. We’ve seen him have some great games, but he we all know that Alex Smith will always be just a game manager. Don’t get me wrong, he manages games very well and knows this team very well. However, I’ve said this before and I’ll say it again. Alex Smith is a good enough quarterback to get a team to the playoffs, but he’s not good enough to win a Super Bowl. He will never be a Tom Brady, a Peyton Manning, a Drew Brees, or an Eli Manning. Kaepernick might not be one of those quarterbacks either, but he at least has the potential to become a great quarterback. He hasn’t just shown flashes of greatness through various games. He showed a whole game of greatness on Monday night. His performance was completely dominant and practically flawless. Kawakami brings up a great point about Harbaugh, who has been supporting Smith since the second he was named the Head Coach. Harbaugh could’ve easily said he’d most likely go with Smith, even when it wasn’t clear when Smith would be cleared, but he chose not to. Also, Harbaugh said this morning that Smith would be cleared later in the week, but he chose to name Kaepernick the starter the same night. This announcement is a strong indication that Harbaugh really does want to see what Kaepernick can do as a full-time starter. The timing of this announcement and the update on Smith is too coincidental and meaningful. Harbaugh wants to see if Kaepernick’s Monday night performance was just a “fluke,” and if he can be effective against a surging Saints team. Don’t get me wrong, Harbaugh has faith in Kaepernick and his abilities.Harbaugh has been given many reasons why he should keep starting Kaepernick, and he’s finally accepting it. Kaepernick will remain the starter, he will keep producing at a high level, and he will only keep improving.